A stress fracture is a fracture that is caused by too much stress being put on a bone. It is not typically caused by trauma and it develops gradually over time. It most commonly affects bones of the lower extremity, such as the tibia in the lower leg, the metatarsal bones of the foot, and the femoral neck at the hip joint. However, it can occur in any bone. Upper extremity stress fractures can occur in overhead athletes and gymnasts. Stress fractures develop over time. Generally, there is a gradual onset of pain with activity only that progresses to affect daily activities as well. The pain will develop at the site of the fracture. The sports medicine physician will ask about the athlete’s training schedule. He/she will be particularly interested in finding out if there have been any recent changes in the type, intensity, duration, or frequency of activity in the month prior to the pain starting. X-rays of the area where the pain is will be obtained to look for any evidence of a healing fracture. Sometimes it can be difficult to see a stress fracture on x-rays, especially if the pain only started within the past 2-3 weeks, or if there has not been any period of rest to allow for healing. If the history and examination are highly suggestive of this diagnosis, but the x-rays do not show the stress fracture, magnetic resonance imaging (MRI), computed tomography (CT) scan, or a bone scan may be ordered to evaluate the painful area further. 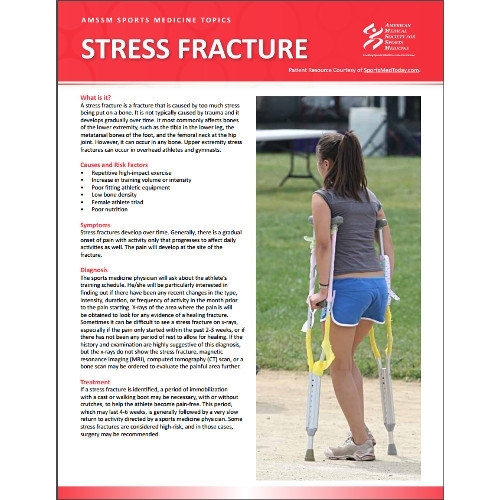 If a stress fracture is identified, a period of immobilization with a cast or walking boot may be necessary, with or without crutches, to help the athlete become pain-free. This period, which may last 4-6 weeks, is generally followed by a very slow return to activity directed by a sports medicine physician. Some stress fractures are considered high-risk, and in those cases, surgery may be recommended. Most sports medicine physicians recommend a period of complete rest from all physical activity that stresses that area for a period of 4-6 weeks. If after that time, the athlete is pain-free, the sports medicine physician is likely to prescribe a gradual return to activity over 4-6 weeks, depending on the previous training schedule, level of physical fitness, and whether the fracture is high or low-risk. DiFiori JP, Benjamin HJ, Brenner J, Gregory A, Jayanthi N, Landry GL, and Luke A. Overuse injuries and burnout in youth sports: a position statement from the American Medical Society for Sports Medicine. Clin J Sport Med 2014;24:3-20. Kaeding CC, Yu JR, Wright R, Amendola A, and Spindler KP. Management and return to play of stress fractures. Clin J Sport Med 2005;15(6):442-447.